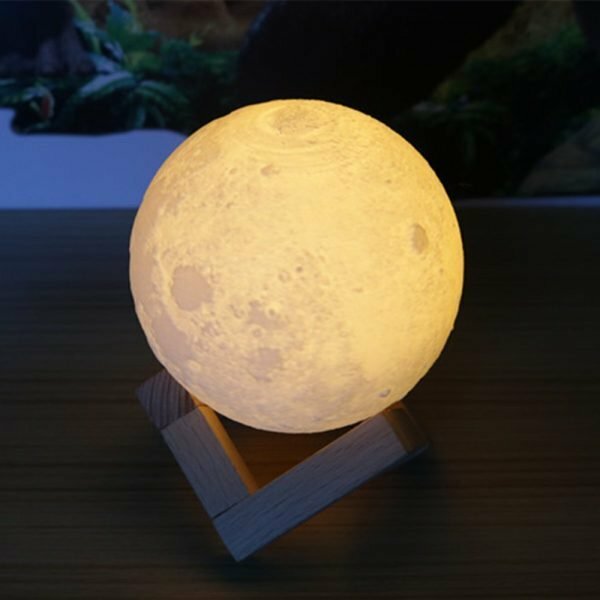 I saw some of the review pictures for this lamp and was really impressed with how realistic this moon light looked so decided to get one. It is so beautiful and lights up easily. When I first got the light I had to charge it before use, but it does come with usb cable and I used it to charge. While charging it gives off red light which turns off once it is fully charged. 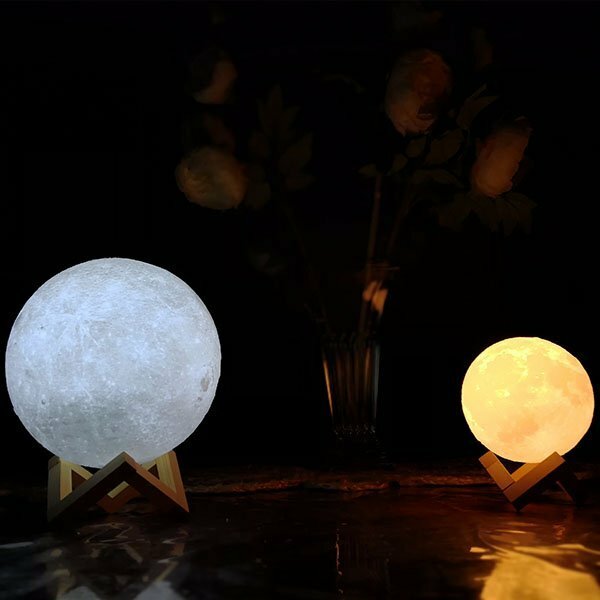 The moon has a small sensor on button to turn it on and off, and switch between warm or cool white lights. Really excited to have this for some upcoming shoots as well, will look great in pictures, happy with the purchase. 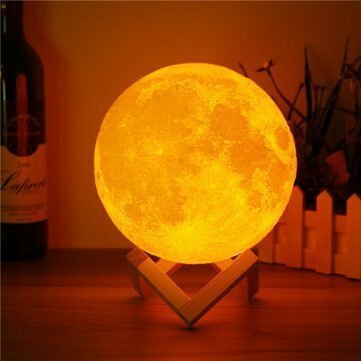 I love this night light sooo much!!! It’s absolutely breathtaking to look at. I was worried it would be fragile but it’s not. I recently read the book “I love you to the Moon and back” to my son. 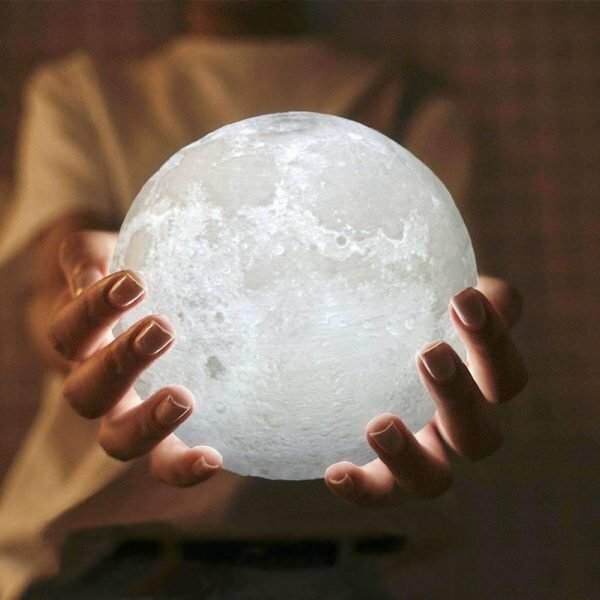 I purchased this nightlight to remind him how much I love him. 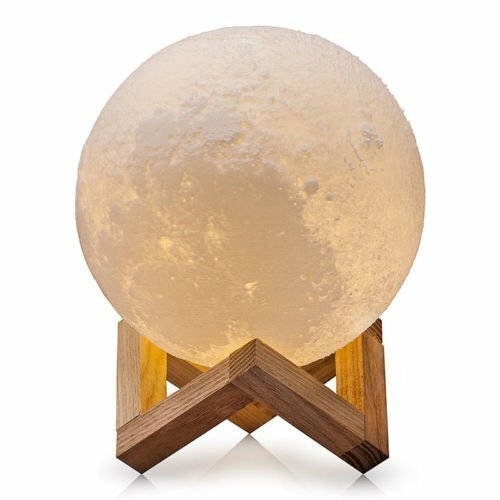 The moon lamp not only looks amazing in photos but it looks amazing in person too! This would make a great gift for anyone including yourself. So I originally bought this moon light for my kids to use as a nightlight in their room… but I loved it so much I decided to keep it for myself!! It has 2 colour choices cool white and warm white light, both which can be adjusted to different levels of brightness. 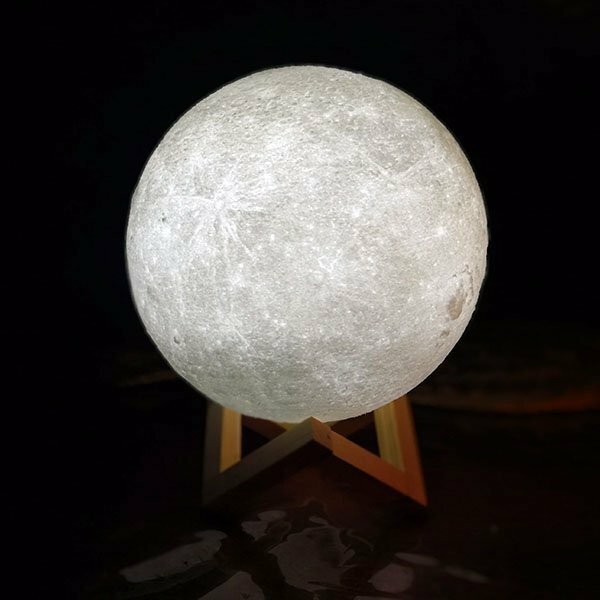 The light looks so cool sitting on my nightstand… it really does look like the moon is sitting on my nightstand! 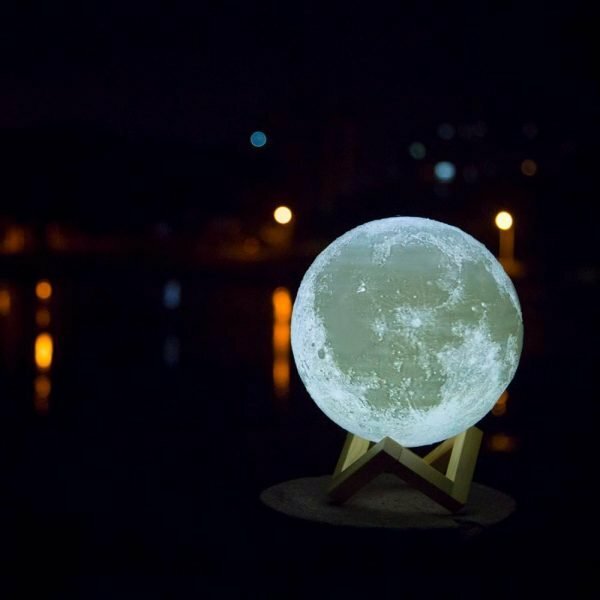 Overall this is the best nightlight ever! We even used it while camping! A must have in my book!! If I could give this ten stars I would! Easily one of my favourite purchases ever… my kids fight about whose room it goes in each night. It’s so pretty! (I’m a moon lover so they are too.) Easy to charge . I will be buying more as gifts for friends… I’m seriously obsessed. Also! I dropped it from standing by accident and thought for sure it would break, but it was perfect… not sure what it is made of but I’m 100 percent happy!!! This is an excellent product. I keep it on the coffee table and guests always comment on it and ask where I got it. 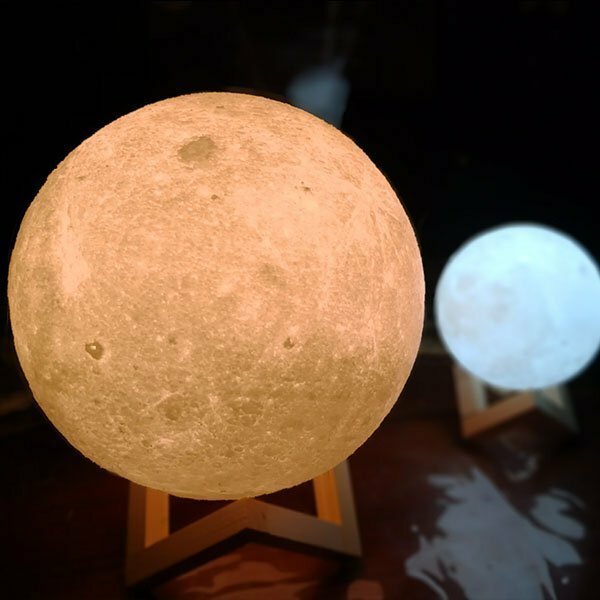 Being an exact replica of the moon is makes it even more interesting. Great product. When it’s not lit up, it does look rather plain. But once it’s on, it’s a pretty nice light. The fact that you can adjust the brightness level is wonderful. It emits enough light to keep the darkness at bay, but not really enough to read by or anything. Makes a nice little gift. Such a genius idea, and product. Received it in 3 days. Very easy to use. The perfect gift for any occasion.